We are both frantically tallying entries and adding a few last minute sponsors you will be excited to hear about! We wanted to give a big thank you to all of our Sponsors and especially our Participants! With close to 300 entries for all of our amazing contests just here at the Got Books? 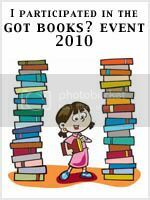 site, not to mention the incredible response to the Twitter Party Friday afternoon, our First Annual Got Books? Event was a greater success than we could have ever imagined! We truly hope you will all be back again next year for an even better and bigger event! Make sure to check back over the next couple of days for the Twitter Party and Kick-Off Contest Winner Announcements as well as an end of event survey we'd love your feedback on! We've heard amazing things from each of the individual blogs participating and it's so exciting to hear, so we'd love to hear more and get some more suggestions for next time. Again, thank you! And we'll see you again very soon! Did you put together a wrap-up or winners post? We'd love for you to link it up below! I've linked up to my post on my blog's contest winner. When can we expect to learn the winners of the Kick-Off Contest? Thanks again for an amazing event! Sure hope to do it again next year! I agree, Angel! It was amazing! Congratulations to all of the winners! Enjoy! Congrats to all of my fellow winners---Got Books? was amazing!